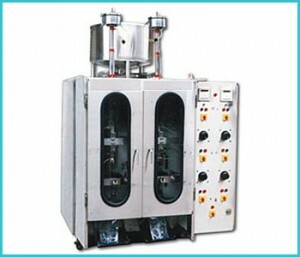 Fully Automatic Liquid Pouch Packaging Machine is specially designed to pack free flow liquid with very high precision setting of quantity. It is fully mechanical model for pouch packing of free flow liquid like Mineral Water, Milk, Buttermilk, Soft Drinks and Liquor etc. Double head model can be used for double purpose and you can pack different pouch or product at other side. Fully mechanical Model Hence low consumption of power. Only 0.5 HP single phase main drives. Auto On/Off facility for heater, for longer life and low power consumption, attached cooling lines. S.S. Tank is provided with this machine. All liquid contact parts are in SS. Easy reach and user friendly control panel. Product to be Filled Any free flow liquid like Water, Milk, Butter Milk, Soft Drink etc Any free flow liquid like Water, Milk, Butter Milk, Soft Drink etc Any Non free / viscous liquid like oil, ghee, lassi, Chatani etc. Any Non free / viscous liquid like oil, ghee, lassi, Chutani etc. Any free flow liquid like Water, Milk, Butter Milk, Soft Drink etc Any Non free / viscous liquid like oil, ghee, lassi, Chatani etc. Net Weight 325Kg. 375Kg. 365Kg. 410Kg. 525Kg. 575Kg. Gross Weight may vary as per the packing of the unit.